Is your Instagram account safe? Is it protected from hackers? Unfortunately, the majority of users on Instagram haven’t taken safety measures in order to keep their account safe, and at the same time, every day, thousands and thousands of accounts on Instagram are hacked and stolen. But what can you do to keep your Instagram account safe from hackers? Having a long and difficult password is obviously a great start, but there’s something that’s far more effective than that. That is to activate two-factor authentication on Instagram. In efforts to make the platform safer for its users, Instagram introduced a feature which allows its users to activate two-factor authentication. Obviously, losing an account is fun for no-one, and when that happens, it means a ton of job and invoices for Instagram since people accordingly reach out to Instagram reach out for help. Imagine if a portion of Instagram’s users would have their accounts hacked and reach out to Instagram for help. That would still be millions and millions of messages that Instagram need to respond to. Have you tried responding to millions of emails? Now, if you’re here, you probably haven’t protected your Instagram account well-enough against hackers, so in this article, you’ll learn how to activate two-factor authentication on Instagram and everything you need to know about it. You probably already know what two-factor authentication is, because it isn’t anything new, really. In fact, before Instagram introduced it, the majority of social media platforms had this feature. Instagram was quite late with introducing the two-factor authentication feature. however, before Instagram introduced the feature to the public, the two-factor authentication feature was available to a small selected group of users only – mainly celebrities with a high risk of getting hacked. 5. It will then ask you to write in your phone number to activate two-factor authentication. 6. Write your phone number. 7. 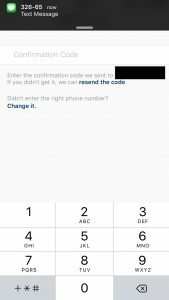 Instagram will send you a six-digit code to ensure that it’s you that is requesting to activate two-factor authentication. Instagram will also offer you to screenshot some “extra” codes in case you don’t have access to your phone or is login into your account from another decide. When you have activated two-factor authentication on Instagram, anytime you log in to Instagram from an unknown device, you’ll need to enter a security code. This security code is sent to you via text message so you can prove that you are the owner of the account. You can, of course, also use the set of codes that Instagram presents to you and allows you to screenshot when activating this feature. When activating, you’ll get the option to screenshot a number of security codes which you can save so that you can still log in to Instagram when you maybe don’t have access to a particular device or when you don’t have any cell reception. Preferably, you should save the codes that Instagram gives, and always have them with you because otherwise, you won’t be able to log in to your account if you don’t have access to the codes or your own phone that is connected to your account. In this backup codes menu, you’ll also be able to ”Copy codes”. Doing so will, rather than screenshotting them, copy 5 backup codes to the clipboard. Since all hackings of Instagram accounts come from different accounts, most often from completely different parts of the world, this Instagram security feature asks for security codes every time someone is trying to log in an unknown device. When you do, you’ll be asked to enter an SMS security code or backup code in addition to your username and password. This is a great additional ask for information because it ensures that hackers can’t get into the accounts they’re trying to hack if they have two-factor authentication on Instagram turned on. Have in mind that when you activate it, need to have a confirmed telephone number for your Instagram account. 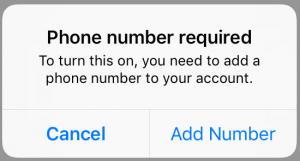 Once you’ve entered your phone number in the account’s settings and confirmed it, it will become the confirmed number for your account. If you are trying to log in to your Instagram account from another device and you have two-factor authentication activated, but aren’t receiving at the security code by SMS, having the backup codes are great to have at hand. 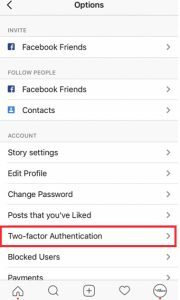 Why should you activate two-factor authentication on Instagram? The simple answer is that it makes your account safer and significantly decreases the risk of it being hacked and stolen. Every year, password and identity theft is increasing. The hacking tools are becoming more advanced, and therefore, it’s important that the methods of protecting yourself become more advanced as well. Unfortunately, many people use the same passwords for essentially everything, and in this case, if hackers access one password, they can access everything. The main reason that hackers hack accounts is so that they can then use those accounts to sell services on the platform. This means followers, likes, and comments, Also, another common reason they hack accounts is so that they can use them as spam-accounts where they promote their services and include spammy links. By activating two-factor authentication, you will make your Instagram account much safer in an event that hackers would try to get into your account. The only way for hackers to access your account is by stealing your phone or accessing your SIM-card which is obviously extremely difficult. Have you been hacked before? Let us know if you believe two-factor authentication will result in fewer hacked accounts on Instagram! You get the codes from inside your account, meaning you have to be logged in to your account to obtain them. If you aren’t logged in, or cannot log in, it’s unfortunately not possible to get the codes. if you forgot your email, phone number, password, you won’t be able to get your account back. If you remember either your username or registered email address, then this is simple. Instagram will send a password reset link if you click “forgot password” to that designated email address or phone number. If you don’t have phone or email, you won’t be able to log in to your account, unfortunately.